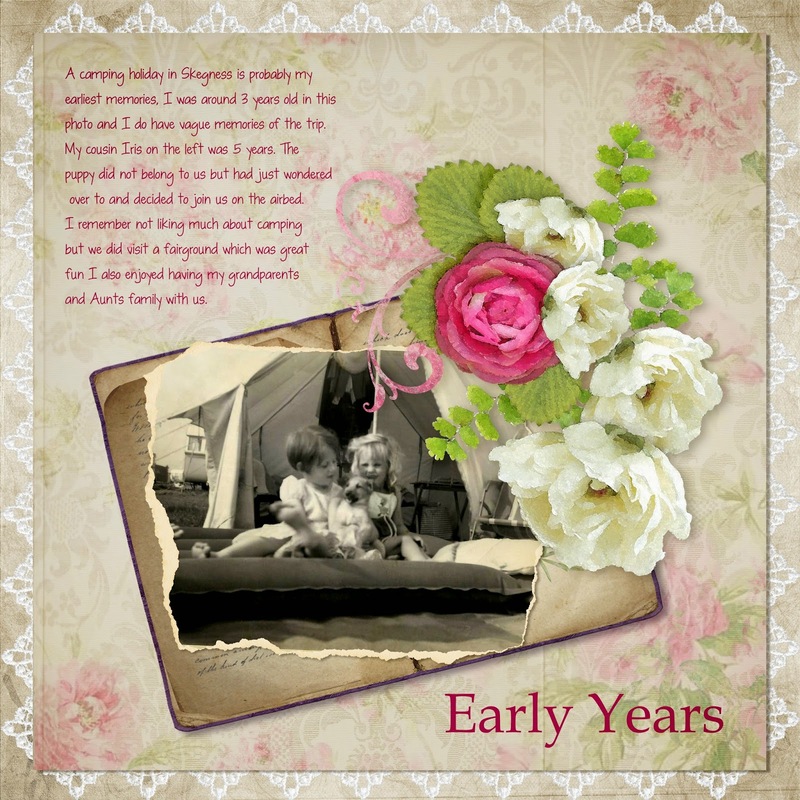 MyMemories Blog: Sunday Designer Challenge featuring....Wisteria Moments & Autumn Owl Designs! Sunday Designer Challenge featuring....Wisteria Moments & Autumn Owl Designs! 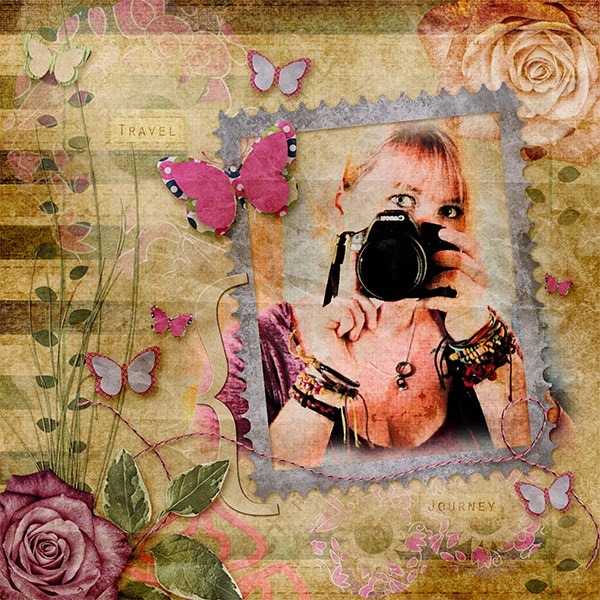 Each Sunday we are going to feature 2 layouts created by own MyMemories Designers! We hope you enjoy it! We probably all have some fond memories of our childhood and I guess I chose this particular theme because I think it is probably a memory that I can vaguely remember simply because of the photographs taken and without them that memory would have faded many years ago now. It also has a special meaning to me because my cousin whom is sitting on the airbed lost her mother just two years later and her memory lives on within these photographs. I used the Edwardian Lady kit to create my layout because I do love a flowery layout and the kit fits in well with the old vintage style of the photograph itself. I also like how at first glance your eyes are drawn from the Title at the bottom of the page across the photo up towards the journaling at the top. It is a neat simple process to use which draws you into the whole page. I used 3 papers in total, the background page with two other papers layered slightly smaller to create a nice border. The top page I lowered the opacity to around 30% creating a subtle flower effect and revealing some of the patterns on the paper below. The elements I kept to a minimum as to not overload the page too much. One of my favourite ways to display old photographs is to use a torn photo mask, giving them more of an aged look. I used the old book to anchor the photo to and finished off with the flower cluster in the corner. I'm very excited to share my scrapbooking style with you all today! I don't get to make layouts very often, as I stay very busy with my design businesses (yes more than one! hehe!). But I was so glad to have a reason to do a layout, and I really love how it turned out. So here is the story of how I made it, and why. I really wanted the photo to be the main focus of this layout. It is from a time in my life when I was a traveling nomad. I basically lived out of my truck (a 1994 Ford Explorer) and hotels. I have never felt so alive or so free as I did when I was traveling, and my goal is to one day be a traveling nomad once again. I also wanted this layout to not be a "traditional" travel layout. For this reason I decided to use my Reise Verden Combo Pack as the base for this page, but added papers and elements from other kits to add to the depth and artistry of the overall piece. I definitely used the Rule of Thirds for this layout. I put my eye at the apex of of the top right intersection of the "grid" that creates the "Rule of Thirds" sections on this page. My style is very graphic and grungy. I used a lot of different blending modes and layers to create the look of the photo. There were 4 layers of the photo, each with its own blend mode, and each of those layers had its own layer mask, to remove the hard edges of the photo so that it faded into the paper. This is possible because I use Photoshop CS6. I also used multiple layers, blend modes and masking to created the background look. I used 4 different papers in 5 different layers with various blending modes and lots of masking to achieve this look. I really liked the stripes, but knew I didn't want them to take over the page, so I masked most of them out, leaving only faint edges on the right and stripes of varying lengths on the left. I also used my leafy vine paper, cut out the center, and blended it so that only the green vines showed, essentially removing the tan portion by fading it into the tan paper below it. The reason I blend like this in my layouts is because fundamentally I feel drawn to fluidity of movement in art. I actually have a very hard time doing more "traditional" types of layouts, with clustering and the like. With graphic style layouts, I can create a story on my page, with fluid movement from one part of the page to the next, but with each space of the page intertwined, connected, and both feeding off of, and feeding into each other space on the page. Once I had my background done and my photo done, it was time to add in the fun bits. I really wanted to highlight my traveling theme, but also focus on freedom and independence of self. So, I chose elements that symbolically reflected my view on those topics. To keep with my Rules of Thirds, I placed the outer tip of the bracket at the lower left intersection, and I placed the pink decorative piece directly over the left vertical "line". Then I placed my elements so that each of the 9 sections had a little something - either a word art, or a butterfly or two. This gives me a good balance to the page I think. I wanted to bring in some elements from my Loreak kit as well, since I very much wanted to add flowers to my layout. I wanted flowers because the majority of the photos I take while traveling somehow manage to be flower photos (butterflies are a close second!). I used the pink rose twice, once in the lower left corner and I also used it in the top right corner for balance. I didn't want it to be too heavy, so I actually blended the rose in the top right into the background papers. I also added some leaves and grass around the bottom left, to add weight against the photo on the page. Once all this was done, I decided I wanted my page to feel much darker than it was. I'm not sure I can even explain why, but it was much too light. It's like the layout was glaring at me and I did not like that feeling. So, I used a paper from my Jardin Antique Combo Pack, placed it on a layer on top of all other layers on the page, and then set the blend mode to Linear Burn. Then I used a layer mask to lighten or darken each area of the page as I desired. The end result, I believe, is a true reflection, not only of my scrapbooking style, of of me as a person. I feel that my graphic layouts really represent who I am at my core; an individual with many layers, some light, some dark, but all connected to each other to create the final presence that is me.